The first line of the Moscow Metro was built till 1935. It united Sokolniki and Park of Culture together. This year has become a starting point of rivalry between stations for the right to be called the most beautiful. It is true that among 206 existing stations, 44 of them are objects of cultural heritage. 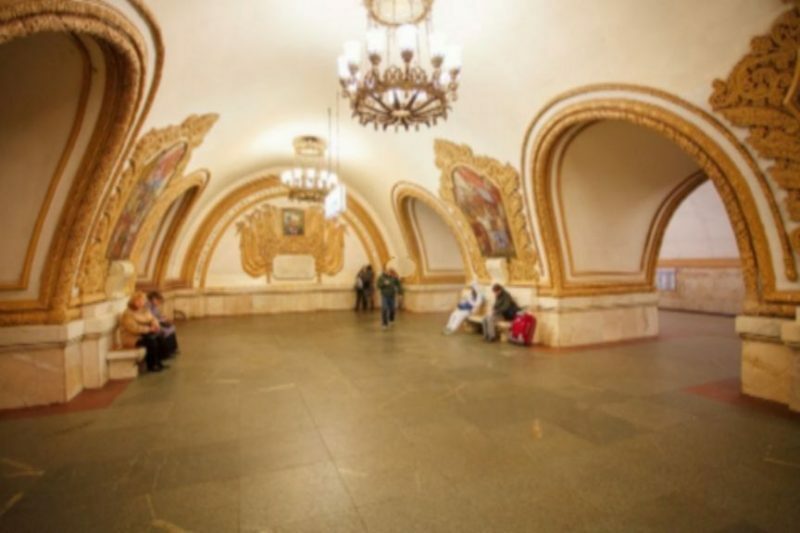 Let's figure out to determine top 10 the most beautiful metro stations in Moscow. The name of the station reminds about Ukraine, whose reunion with Russia was the subject of an architectural plan. In the end part of the station folk festivals in Kiev in the form of a mosaic panel are depicted. The pylons are the main attraction. They depict the national Ukrainian ornament. The space between pylons is decorated with frescoes and stucco. During its building, the rock crystal, gray marble and red granite had been used. The Kiev Ring line looks more like a picture gallery than a metro station. Mosaic panels in the vaults between the columns are framed by frames under the color of the tree. The beds are also decorated with stucco imitating a wooden thread. The station is dedicated to the topic of friendship between Russia and Ukraine. One of the exits was decorated by French architects who borrowed projects from a well-known European designer E. Gimara. It is a little modest among its stations-companions, but deserves the attention. Here more elegant round column dark-gray marble and light-gray marble with molding of spikes of the wheat. On the station the shooting of some films of the Soviet period were carrying out. The layout of station was shown at the exhibitions in New-York in 1938, where it was marked by numerous awards. Mayakovskaya is similar to the underground palace in the style of the "Stalin neo-classic", but also is not devoid of decor in the style of avant-garde. The station is airy and elegant in its construction. Decor elements are covered with stainless steel, which makes Mayakovskya modern. The greatness of the ancient temples can be seen on Novoslobodskaya. It is distinguished by its majesty, the richness of the interior and the exterior. This station is a cultural heritage object. Stained glass windows in columns are illuminated from inside and are decorated with steel and brass. On the mosaic panels fantastic plants and flowers are depicted. The main topic of the station is peace; one of the panels is even called by this way "The peace all over the world". We move from the ancient temple to the museum of sculpture. In semicircular arches, there are 76 sculptures made of bronze. They depict students, revolutionaries, workers, and collective farmers. Each of the sculptures is unique in its compositional design. In its decoration white, gray and golden marble has been used, which makes the station expressive and rigorous. The Prospect of Peace also includes 10 most beautiful metro stations in Moscow. The station is devoted to agriculture. Massive pylons are lined with cream marble. The top of the pylons is decorated with plant images and geometric ornamentation. The medallions depict Soviet peasants. On the ceiling there is a rhombus draft. On Smolenskaya, the theme of patriotism and the defense of the motherland is arised. The walls depict the soldiers, in the escalator hall - the Order of Victory in the form of a mosaic, at the end of the station - a group of soldiers and fluttering banner. In the corners of the massive pylons there are semicolons. Above the marble benches lamps are hanging that emit soft light. Taganskaya continues the military theme. On pylons profiles of soldiers with badges of all types of troops (pehota, aviation, artillery, military-navy and others) are depicted. Panels are made in pleasant blue tones. The lower part of the pylons is lined with black marble with white veins, the pylons themselves are white. Multi-line chandeliers perfectly combine with the design of the station and deserve special attention. Opened in 2007, the station completes top 10 the most beautiful metro stations in Moscow. It has a contemporary design. Between the walls of light brown marble the columns of dark-green marble are located. The real decoration of the station is mosaic stained glass, which depicts ancient Russian cities. The ends of the station are decorated with works by Zurab Tsereteli. The armrests of the benches turn into openwork metal constructions, which also serve as supports for lamps.